At this point, it’s no surprise that I am a die-hard fan of Doon. I reviewed the fabulous fantasy just over a year ago, and if you’re here because you’re curious about the gorgeous castle header and what it means, here‘s all you need to know before reading on. Oh yeah, and there’s also an interesting (and weird, mostly weird) interview with Carey and Lorie right here, and, yes, that’s right, I have more for you lovely folks. 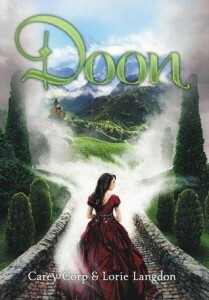 Be sure to check out the Destined for Doon cover reveal we did quite recently, in case you missed that. And, if you’re wondering, yes, I’ve read said sequel and there’s a pretty fancy review coming along that’ll feature music and other odd pop culture, but you won’t be hearing about any of that for another month or so. All my apologies. Or, well, some. In the meantime, enjoy one of Carey’s favorite cut snippets from Doon! With a lithe skip, Vee wove her way toward the center of the dance floor. She leapt into the melee, her feet an elegant flurry of rhythm and improvised high-steps. More than a natural, she was sublime. The room began to take notice as she moved in perfect sync around the other dancers and into the direct sightline of a certain blond Laird. “Look.” Duncan gestured with his head toward the spot where moments before, Jamie had been in intimate conversation with Sofia Rosetti. In a rare, unguarded moment, the MacCrae had stopped paying attention to anything except Vee, who whirled with the grace of a ballroom dancer and the enthusiasm of a child. While he watched, a stunning smile of appreciation lit his face. His eyes seemed to drink her in as if she was the elixir of life. But I’d seen enough of the prince’s ever-changing moods to know whiplash would soon follow. “But he has you, right? And friends, like Sofia?” It was a shameless attempt to get the 411 on the boy who’d captivated my bestie’s fragile heart. Duncan leaned in slightly to test the sincerity of my concession. Determined to ignore his nearness, I feigned interest in the far side of the dance floor. As Vee twirled past Jamie, the MacCrae’s hands reached for her. With a frown, he fisted them at his sides before darting a guilty glance in the direction of his former bathing partner. I filed that information away to share with Vee at a later time. The music stopped. In the brief pause, Jamie walked toward Vee with renewed purpose. The first strains of the next, slower tune trembled through the hall. Jamie grabbed Vee’s arm and spun her close before she could dance away. The air in the room charged with anticipation and I held my breath to see what would happen next. What happen was—Duncan stepped in front of me and blocked my view. The intensity of his gaze caused something foreign to uncurl in the pit of my stomach. My whole body felt tingly and strange. Without giving me time to think, he pulled me into the center of the fray in a firm but gentle grip. His large left hand held my right while his other one cupped my waist. Heat radiated from our points of contact so that I felt dizzy. For a moment, he stared at the juncture where his hand rested reverently against the curve of my hip, and then his eyes climbed to mine. His ridiculously gorgeous face shone with triumph as he pulled my body flush against his and my curves reshaped to his hard angles. My heart pounded wildly in my chest—or was that his heartbeat?—as we slowly began to move to the music. Add to Duncan’s list of accolades, accomplished ballroom dancer. In less than thirty seconds, I realized I was outmatched. Panic flooded my veins making me desperate to hightail it to the powder room. Dancing had never been my forte. If I had any hope of keeping up, I would need to channel my inner Anna Leonowens. With a lift of my chin, I began to whistle a happy tune in my head imagining he was the King of Siam and I was unafraid—etcetera, etcetera, etcetera. To his credit, he never said a word. He just grinned, held me tighter, and twirled even faster across the floor. In unison, we danced until our worlds fused together in one dizzying blur. Doon is now on sale in softcover.